Apple just released the new iPad, and buyers across the country are asking the same question: Should I buy AppleCare? When you pay $829 for a 64GB 4G iPad, paying another $99 to protect it may seem like an easy decision, and for many consumers it is. After all, it would be a huge bummer to have to buy a new iPad if the old one breaks, and the product warranty offers valuable peace of mind. But is this a smart math decision? We know how much AppleCare costs, but how much is it worth? To answer this, we can use what economists call expected value. If there’s a 10% chance that the iPad will break, we can say the warranty is worth 10% of the replacement cost, or around $83. Since the warranty costs more than it’s worth, you shouldn’t buy it. On the other hand, if there’s a 20% chance that the iPad will break, you should buy it; here the warranty is worth almost $170, much more than the $99 price tag. Of course, there are a number of other factors that affect how much a warranty is worth. For instance, how long does it last? Does it cover everything or only some things? Are there any additional fees? Not only that, but AppleCare doesn’t cover everything. Drop it on the floor? Not covered. Drop it in the bathtub? Not covered. Lose it? Nope. The battery no longer holds a charge because you’ve used it so much? Maybe, but probably not. For the most part, AppleCare only covers defects caused by Apple itself, but these don’t seem very likely from a company whose products “just work.” Even if AppleCare does apply, though, you may have to pay a $49 service fee, and you can only do this twice. In reality, all of these factors mean AppleCare is worth less than expected value would suggest. Regardless, even if AppleCare did cover everything forever and with no fees, it might still not be worth it. 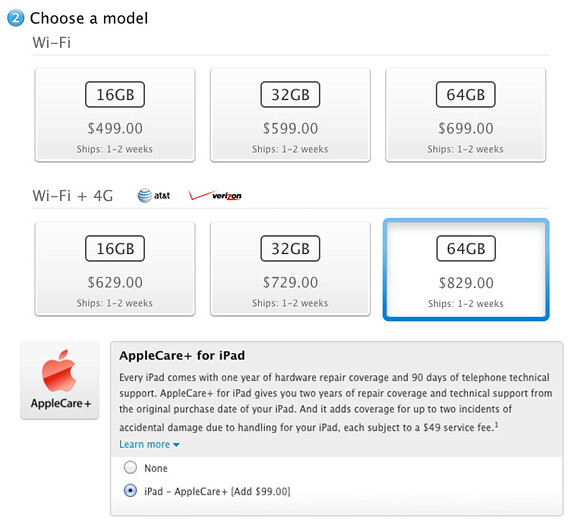 With the $829 iPad, there would need to be a 12% chance that it would break for AppleCare to be worth it. Is this realistic? I have no idea. But you know who does? Apple. And you can be sure that they’re going to price AppleCare in a way that guarantees that they make money. In other words, the mere existence of the warranty --- the fact that they’re even offering it to us --- suggests that it’s a bad deal…for consumers. Of course, there are plenty of people who will disagree. To be perfectly honest, I bought AppleCare for my first iPhone, needed it, and was really glad I had it. But this doesn’t mean it was smart to have bought it. It’s like winning the lottery; it’s nice being a millionaire, but I still shouldn’t have bought the ticket in the first place! In the end, AppleCare is by mathematical definition a bad deal. So why do so many people (myself included!) buy it? When the Apple salesperson asks if we’d like to buy the warranty, we think only about the worst-case scenario --- having to buy another iPad 366 days from now (even though we’ll probably want it, since it’ll be the new one!) --- without considering how likely it is that it’ll actually happen. Economics Nobel laureate Daniel Kahneman has shown that people consistently weigh loss more than they weigh an equivalent gain --- that losing $100 hurts more than finding $100 feels good --- and that’s exactly what’s happening here. In reality, the worst thing that can possibly happen is that we have to spend $829 on a new iPad. But if this feels like $1000, then the subconscious desire to avoid pain will cause us to artificially inflate the perceived value of AppleCare. By placing a dollar value on peace of mind, we end up spending more on a product warranty than it’s really worth. So does this mean that it's never a good idea to buy a warranty? We'll pick that up in part 2. When ever I rent a car I have an internal fight in my head over the rental companies insurance. Fear of loss is extremely powerful. On another note, I look forward to hear you speak at the Wisconsin Mathematics Council Conference in early May. I did buy AppleCare for all 5 iPhones for the family because, like you said, I was afraid of forking out [ironically] MORE money should my teenagers decide to drop them. However, I have a 64GB iPad 2 with AC because I thought to myself, "God, this is costing so much already, I can't add another penny to this purchase!" So, for me it was more because I trust my careful handling of the product more than I trust my kids'. Glad you brought up the lottery, currently at $460 some million in California, but it just goes against my math fibers to buy a ticket. Mr. S, doesn't the credit card that you use to rent the car have rental car insurance already? Hmm... not sure that we should equate "irrational" with "not choosing the option with the highest expected value". Sometimes it's absolutely rational to choose an option that is lower in EV than an alternative.